From season to season our flag layouts can change. 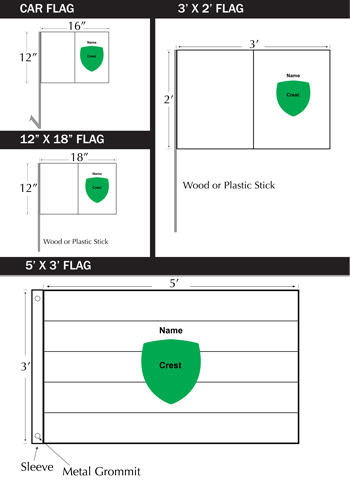 Please see picture across for our most common flag layouts. 5'x3' Flags: - Most of our 5'x3' crested flags comprise of 5 stripes as shown in image across with the county crest in the centre of the flag. The flag is finished with a sleeve and metal grommits for mounting on wooden stick/pole (not provided). Plain versions of this flag are also available in just half/half and also chequered. We do reserve the right to change these layouts from time to time but as a general rule the layouts pictured cover most of our flag types.